This is only the fifth time I have reviewed/previewed a game being released via Kickstarter. It is not something I do often but every now and again I come across a game that I think might need a small spotlight to make gamers both aware of the game and also to better inform them as to whether the game is worth backing or not. If this review can achieve both of those objectives then it will be mission accomplished. For the record I was approached by the design team to see if I was interested in covering the game. Given my interest in sports games and soccer/football in general I accepted. Beyond that I have no affiliation or connection to the design team or the game itself. In the gaming world sports games are not uncommon but many are not that great. In the field of sports games, soccer/football is represented fairly well I guess but many of them are really quite poor and often the trivia styled game is the most common…and these tend to be rubbish. Games like Streetsoccer, Soccer Tactics World and Subbuteo are three of the most successful soccer games to spring to mind and each of them approaches the World Game from a different angle or game style. Now there is Masters of Football. Here the players are NOT moving players around the pitch according to various rules or dexterity skills, now they truly take the reigns, as the players are now the Managers, the Gaffers that run the show and must control every aspect of their team. This is football at the abstracted level. That’s right…Masters of Football sees each player as a Manager that must draft players, select and impose their match tactics and make the most of every opportunity to see their team play their way through a tournament and get the wins needed to sit atop the table come the end of the competition. But it isn’t abstracted to a ‘Championship Manager’ (that’s a video game if you aren’t familiar) level, as each game still needs to be played. But playing each game is a quick, thrilling and effortless affair that requires the use of dice (and the occasional card play). The game is about management but there is no ‘mind-boggling’ micro-management to be found anywhere. In short the game really lets you try to control those interesting elements of Football Management without bogging the game down in unnecessary complication. That’s some achievement. Let’s take a closer look and see if we are dealing with the English Premier League of football games or the Taipai 4th Division. With 4 teams there will be a total of 12 matches and each team will play 6 games…two against each other team, thus allowing for a home and away match against each opponent. Think of the group stage of the Champions League and you pretty much have the picture. Be the Manager - At the start of the tournament each player is given 2 Manager Cards and they must select one which they will play as. Each manager has a special ability, budget, Academy limit and of course a name. Some of the names and illustrations are clearly mocking efforts of real world counterparts and are quite amusing. This level of humour is even more prevalent in the Player Cards and it adds a nice fun factor to the game and serves as something of an in-joke to those that follow the Beautiful Game. Draft Your Team – Each Manager is given 1 Gold Player, 2 Silver Players and 3 Bronze Players at random and from these they must draft their initial team of 3 players. Of course they cannot exceed their budget and a player may well want to save some money to see them beyond the first game. A player must have 3 players however and if they only choose to buy 1 or 2 players from their selection they must randomly draw and take players from the Wood quality level. Read this as total hacks that are good for holding a position but not a hell of a lot more. Players that are not bought at this time remain in a Manager’s hand and can be drafted into the side at a later time. This feels a little like having scouted players before they get signed. Skills up Your Sleeve – Each Manager then gets dealt 5 Action Cards, These cards cover almost all aspects of the game that you can think of. There are pre-match cards and in-game cards. Actions that cover diving, TV Rights Negotiations to earn extra cash, media management skills, tactical cards to affect a match and bribes. They are quite varied and can be very powerful if used in the right situation. But with only 5 to use over the course of 3 matches (5 more are earned for the back half of the tournament), they are not completely game changing and overpowered, which is a good thing. Managers can also throw an Action Card away to gain a new one for a cost of 1 Million, but that will mean less money to buy players and pay for the playing of Action Cards in the future. Money, Money, Money – Having already drafted players and spent a reasonable chunk of the starting budget, each Manager is given another 5 Million Footies (as the currency is called). I guess this is money earned for entering the tournament I guess. This money is essential though as many Action Cards require a small cost to play them too. Let the Action Begin – Finally it is time to begin…the first match. Before beginning, a tournament draw needs to be created. The game comes with a paper format but I highly recommend the app or program that the Design Team have created. It can be accessed via their website and by simply creating the team names it automatically creates the draw and then takes care of calculations for points earned and goal difference. It’s lovely and really adds to the experience as you watch results update and ladder positions change over the course of the tournament. Masters of Football is a really streamlined design that allows the games to flow quickly. The basic flow of a single match within the Championship or tournament structure looks a little like this (but of course single matches could be played instead, but the game tends to shine in the tourney format). Each player selects their 3 players for the match. In game one there will be no options of course, but as the tourney unfolds Managers may find they have 5 or 6 players to choose from. These players are placed on the pitch in one of the designated spots face-down. The actual position is of no relevance as the board serves more as a game-mat rather than a pitch in which to move players on. Tactics Selection – Each Manager has the same 4 Tactics Cards to choose from and must select one to play and put it face down on the pitch. The options include Possession, Direct, Aggressive and Defensive. The factors that help a manager choose which Tactic to select are the skills of each player they have on the pitch (each player has stats for all 4 tactical options) and the nature of the Action Cards they hold. Some Action Cards will prescribe to one of the 4 tactical options and can only be played if that tactical style has been applied to the match. A manager can quickly identify what tactic his players prefer or excel at by adding up the total of each stat for the players that take to the pitch (both in defence and offense). Generally speaking it is wise to then select the tactic that has the greatest total. Of course the preferred tactic may change over the course of the tournament as new players get signed. 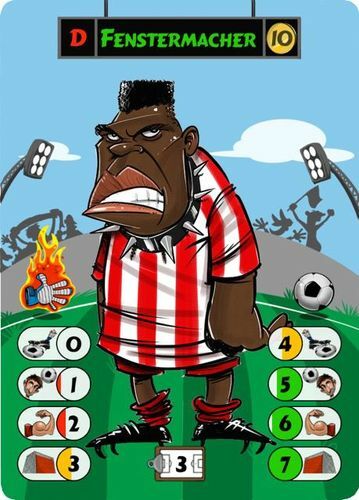 Pre-Match Cards – Managers may have some pre-match Action Cards in hand and wish to play them. There is a cost for doing so (which must be played using footies – the currency of the game remember) and a particular symbol denotes whether a card is a pre-match or in-game card. Should both Managers wish to play Pre-Match Cards, the away team must reveal one first before the home team shows theirs. This is just one of several home team advantages. Reveal Players and Roll for Tactical Battle – The Managers then reveal their players and must roll for the Tactical Battle. This roll represents the battle of wills between two managers to see who is able to control the game by having it played in their style. It reflects one of the more subtle natures of the real game beautifully. Each player rolls a white and black dice (known as the tactical and Genius dice). To that total they + the tactical knowledge of their players on the pitch (another stat held by the players), then they + any bonuses given by the play of Pre-Match Cards and then they + any tactical bonuses on their Manager Card. The Manager with the higher total wins the tactical battle and gets to turn over the Tactics Card that they selected. This sets in stone the stats that will be used for all players on the pitch, well for the first half anyway. Set Team’s Offensive and Defensive Values – Now each team can set their Offensive and Defensive values for the upcoming half. They add up the total of the tactical stat in play for each of their players to determine their attacking and defensive ability. These values are recorded using plastic markers and placing them on the appropriate value. This action also decides which dice each manager will use when they are attacking and defending and these are taken into their die pool. The trick here is that there is only one of each coloured dice in the game…so what happens if both teams have the same stat for defence or offence? Well that applies another Home Team advantage as the away team must drop down a dice level. Dice Level I hear you ask? Well the higher a team’s skill in defence or attack the better the dice they gain access to (because the dice are not uniform in values). Therefore a team with highly skilled players will have those skills reflected in their ability to find the net or keep the opponent out. But because they are dice, nothing is ever guaranteed of course. It is possibly the strongest element of the game. All of the above may look like quite a few steps but it literally takes all of about 5 minutes once you have the steps down. The only real time is in analysing the players at your disposal and deciding which tactical approach to take. To help with that my son and I found that it was smart to write down the stats for each of the 4 tactical options in both defence and offence at the beginning of the game. This simply meant it didn't need to be re-calculated before each match. Even if new players are signed, it was still quite easy to see how the stats would change by swapping two players in and out. Kick-Off: Time to Play – Now to the really fun part, seeing how the game plays out and if your team and tactics will win the day. The flow of a single match is managed with the use of the Match Sequence, which is visually represented by the center circle of a football pitch in the middle of the board. It is made up of 6 in-game segments that allow both sides to attack and defend on three separate occasions, essentially simulating the flow of a game. An additional 2 segments cover actions to be played out at half time. Attacking and defending within the game is really quite simple. The attacker rolls the single dice assigned to them as per their attacking total and also rolls the black Genius dice. These two dice are added together to form a total. The defender does likewise, rolling the black genius dice and adding their defensive dice as per their defence score to get a total. If the attacker’s total is greater than the defender’s total, they have scored a goal. Any other result means that the midfield and defence have managed to keep them out. Regardless of the outcome the play then moves to the next segment of the Match Sequence and the play continues until the half is completed. Should a team score, then a simple click on the tourney app adds a goal to the scoreboard, which is all digital, just like a scoreboard at a real match. It's a really nice add on and helps to rub it in and build the tension for your opponent! Half-Time Tactical Roll and Substitutions – At half time the Manager’s must re-roll for the Tactical battle to see if the current tactics remain in force or if the other manager succeeds in changing the game to their style of play. The Manager’s can also make a substitution should they have players on the bench. Subs can be made before or after the tactical roll and there are consequences for the timing, which I won’t go into here. If substitutions are made of course then the teams may need to adjust their offensive and defensive skill totals as the change of players will likely have made a difference (which of course is the point). The second half is played out, but this time the sequence is reversed, meaning that the order for attacking and defending is reversed. This is a really great feature to as it always sees the home side finish strongest (in attack) and adds to the tension. Injury Time and Final Whistle – Should the scores be level at the end of full time, the Home Team gets one more home team advantage and can roll the white tactics dice. On a result of 3 or more (60% chance) they get one more attacking play to change the result. For me this simulates nicely the desire of the home team to take the 3 points and the advantage of the home crowd cheering them on. If a 1 or 2 is rolled though the final result stands and the game is over. The match result is recorded or plugged into the Championship App and points are added to the table and goal difference is calculated. A full match as outlined above should take no more than 5 minutes at the most. It is really quick but still manages to create excitement and 'oh so close' moments. And Then… - All that is left now is to play out the rest of the tournament by playing out the next match as outlined in the schedule with the two appropriate Managers and then the one after that and so on. This is essentially what Masters of Football has to offer from a game mechanics and strategy point of view. Playing with other Player Counts – The game also allows for less than 4 Managers by using NPTs (Non Player Teams). Four such teams are offered up and they have set players and a preferred Tactical Strategy for each game. A Manager not involved in a match takes control of the NPT and the only disadvantage they have is that they don’t get Action Cards. Never fear though as they all have a Gold Player and 2 Silver Players, so they are skilled enough. But it should be noted that there really isn't a cap on how many people can play. A 6-player tournament would work really well and if you can get 8 or 12 together then it would be possible to create one big tournament or create 3 separate tables (log onto the app on 3 different computers or just record them on paper) and then have the best teams play-off ala Champions League style! Of course the game is won at the completion of the final match, by the team that sits atop the Championship Table. If two teams should tie on points then goal difference is used. If there is still a tie then results between the teams can be used to determine the winner. 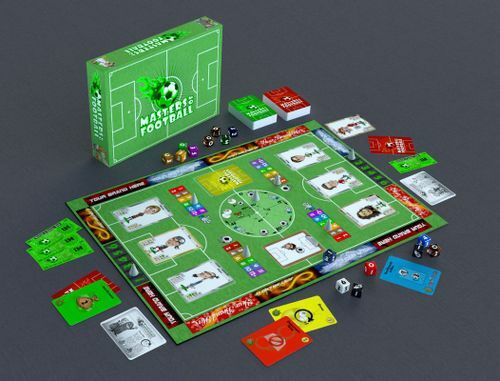 At its core, Masters of Football is a dice game that is heavily influenced by strategic decision making and just a few surprise elements in the form of the Action Cards. The beauty of the engine though is that the dice are not completely random. Managers are rewarded for setting up their team tactically to match the strengths of their players…thought must be given to the resources you have. All of this is really the pastry that makes up the meat pie. Structurally the game is very good. Reflecting the Real Game – The meat in the pie though is that teams featuring good players and the right tactics have a greater chance of beating a lesser team. This is excellent game design as it rewards the Managers that take the time to balance their team and get their tactics right. It achieves this through the use of dice that are not uniform in their values and then using the player skill totals based on the tactics of the match to determine which dice a team has access to in both defence and offence. This is really excellent design work and should be applauded. Sport is a Fickle Master – But the tomato sauce on the pie is that having access to better dice in attack and defence may give a Manager a better chance to win matches but it is never guaranteed. The nature of dice (even these that consist of varying values as they do here) is that luck can still go for you or against you. In this way Masters of Football manages to simulate the nature of the real thing beautifully. Statistically a better team or one with the right tactics should win out more often than not, but there is always that chance of an upset. This is something I really love about the balance of the game. The Changing Landscape – The game has another trophy in its locker in that the nature of matches and the tournament will change the deeper the game goes into the Tournament. That is because players are gaining access to more money and can draft/sign more players and access new Action Cards. This gives the managers greater options in which team takes to the pitch and they can change things at halftime if they have lost the tactical battle early on. This element helps keep the game interesting match after match and gives each Manager something new to respond to. Limited Resources – Both Action Cards and Budget are the two finite resources that must be managed carefully throughout the game. Budget or ‘footies’, are critical in drafting new players but also in paying for the use of Action Cards. The Action Cards themselves are very limited with only 5 being available for 3 matches at a time (unless you save some for deep in the tournament). In the context of the game’s theme, these limited resources reflect well the demanding job that is Football Management. Speed of Play Plus Excitement – What really stands out about the game compared to other options on the market is that each individual game is really very quick to play through, but that doesn’t come at the expense of excitement or fun. Of course every player’s mileage will vary as in the end the action is resolved through the rolling of dice and scoring goals is a very immediate thing (you either do or you don’t). This is quite different to a game like Streetsoccer where players must be moved and positioned and the ability to score or defend is not quite so immediate. But as a dice fan I find it exciting to watch those rolls play out. To see the superior side dominate an attacking period or the underdog hold off the attacking juggernaut. The Integration of Theme and the Moving Parts – What I think will ultimately see Masters of Football take its place in the pantheon of 'respected football titles' is that the theme is wonderfully realised through its mechanics. On top of that the various moving parts integrate very well together with the decisions made in one area (player selection and tactics) having a direct and purposeful impact in another (the matches themselves). This is really what allows a player to feel that they are in control and that their decisions matter in the game. As gamers that is what we all want I think. So Should You Back this Project or Not? And so we get to the pointy end of the stick. You are a fan of sports games and want something a little different to what is already out there. You are a fan of soccer/football games and the notion of overall Management is more appealing than the direct movement of physical players on the pitch. You love dice games but would love just a little more control and reality from the 6-sided gods. You're looking for a sports game that is more about a single match, a game that allows you to play in a mini-tournament where several matches decide your fate. You are after a game that can be played in bite-sized chunks and returned to at a later date if needs be. You like games that have simple rule-sets but still allow for the thrill of the moment. You have nothing better to spend your cash on at the moment and are looking for something quite unique in the gaming scene. You like a laugh and know enough about football worldwide to get some of the in-jokes based on player, manager names and illustrations. You like beer and pretzel games that can entertain a group of 4+ and only take a couple of hours to play (and allow you to still have some sport playing on the TV in the background). If a majority of the above points are actually a negative rather than a positive. I can only give Masters of Football the thumbs up for what it sets out to do and actually achieves. The core mechanisms that are the player statistics and how they help determine the dice that will be used by each team in a match is excellent. The design of the dice variance to help represent the relative strengths of teams is fantastic and should appeal to anyone that likes the potential for an upset, whilst still allowing a strong team (based on decisions you have made) to hold a slight edge. The excitement generated by each game is excellent as tension is always present and match results are remarkably akin to results seen in the real world. Masters of Football is definitely worth owning if you are a fan of management games or sports games in general. Dice Game fans should also get excited by Masters of Football unless they like their luck to be of the 'wildly swinging' variety. I already have 3-4 football titles in my collection but this is one I definitely want to add as I can't wait to get some mates over and run our own tournaments. Till next we meet may your strikers find the top corner and your defence remain watertight. Darn, thought this was a football game, not a soccer game. 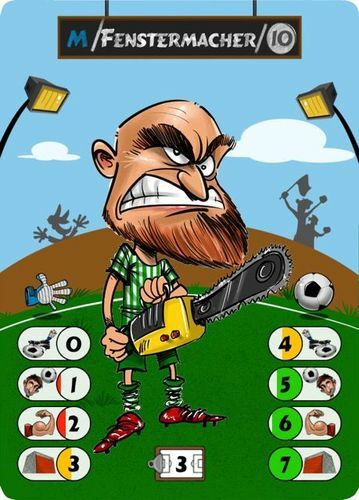 We have put significant effort behind the game and (check this out) we are convinced that even board game players that lack the enthusiasm for soccer will find the game very enjoyable, so different from everything seen in the football board game until now! Kickstarter campaign starts tomorrow, please let us know thoughts on the concept! Great review as always, thanks. Is the play time 40-60 minutes as in your initial summary, or a couple of hours as in your conclusion? That thought dissipated once I saw who the reviewer was. Neil will never walk alone. No room for HandEgg here, just football (I kid too). Honestly the length of the game (as in a tournament) will really depend on the number of teams in the tournament. The best reference point for timeframe is to say that a single match will take between 5-8 minutes. The number of games will then determine how long the tourney will take. Although we recommend 4-team championships, Masters of Football can be played up to 8 players. So is this a 2-4 or 2-8 player game. To play 8 players are two games required? Great review.... Made me into a backer. The reality is the game can accommodate any number of players. However a single copy will only allow 2 to play at a time. For me that isn't a problem at all as the format is perfect for those social get togethers where non-players wait their turn playing darts, chatting over a beer etc. The one limitation there would be is in the physical number of 'player' cards with which to draft enough teams and still have enough left to have a selection for mid-touney acquisition.